I’ve been doing some of these chats realtime because my only answers were Tweet-sized anyway. Figured I’d compile them here for reference, and for ease of reading. Q1: Do you stick to webcomic communities and services that cater to webcomics for promotion? How is your strategy working out? Yeah, mostly. I have a constant 1-cent-or-less Project Wonderful campaign, and do intermittent more-expensive one using the best-performing ads. It’s a steady referral source. The trick IME is trying lots of different ads, introducing new ones every so often, and then looking at metrics to see which get the higher click rates. 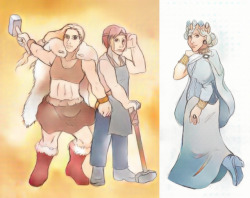 And I make sure both BICP and Leif & Thorn are on resources like the LGBT Webcomics Link List. Q2: What are some other options outside of webcomic communities for sharing your work? Think about your genre & build on that. Mine are LGBT-centric, so I’m writing some posts for @LGBTQReads, to put a variety of recs in front of an audience that likes LGBT+ stuff but might not have thought about webcomics before. Q3: What things make you nervous about sharing your comics outside of webcomic communities? Yeah, this. It’s not like webcomic communities are magically nicer or better than the rest of the internet. Or like my strips are somehow inaccessible to a reader who’s never read webcomics before. This is peak #relatable for all of us, I think. Q4: What kinds of results have you had when talking to people about your comics outside of the webcomic communities? / Q5: What are resources that you have used outside of the webcomic niche to promote your webcomic? Really just the stuff mentioned above. And when people IRL see me drawing, I tell them what it’s about, maybe give them the URL of the strip I’m working on. …yeah, this is how you can tell someone isn’t familiar with webcomics. Based on what I know about webcomics, I though you ARE doing it full-time … as a second job on top of the one which actually gives you money. In terms of raw time, sure! But people think it should be so profitable that I can quit all other jobs and live comfortably on the webcomic proceeds alone. Which wildly overestimates the amount of money floating around in this field.